The CUNY School of Medicine PA Program fosters patient centered communication skills, structural competency and practicing evidence based, cost effective quality care and system based practice. The CUNY School of Medicine PA Program curriculum prepares students to practice evidence based care and to engage in scholarly activity to improve patient outcomes. We inspire graduates to work in health workforce shortage communities and with patient populations out of the mainstream of health care delivery. We encourage graduates to be advocates at the local, regional, and national levels for the best care for patients and their communities. The CUNY School of Medicine PA Program encourages graduates to practice primary care in health workforce shortage communities. The PA program is located within the Central Harlem Community and fosters a strong connection between students and the surrounding community and healthcare institutions. The CUNY School of Medicine PA Program encourages leadership through its curriculum and its established PA Program Society and PA Club, whose officers and members are from our PA student body. The PA Program Society participates in the annual meeting of the Student Academy of AAPA and in community outreach. The PA Club meets weekly to discuss various PA issues, and answer questions from the general campus regarding PA student life. The CUNY School of Medicine PA Program aligns with the PA Profession tenets of professionalism and ethics. From the onset of matriculation throughout the entire program curriculum, PA faculty model these tenets and reinforce our expectations about these attitudes and behaviors. The CUNY School of Medicine PA Program provides our students with interdisciplinary healthcare team experience and is explicit about the important contributions of each member of a healthcare team. We actively encourage intellectual curiosity and critical thinking necessary for life-long learning, leading to the continual improvement of patient care. The CUNY School of Medicine’s PA Program’s curriculum engages our students to direct their own learning, constantly reflecting and assessing their skills in patient care, scholarship, community service and leadership. Relevant to embark on their life long pursuit of learning, the PA profession requires that PAs acquire Physician Assistant National Certification and meet ongoing requirements for Continuing Medical Education in order to maintain certification. Successful achievement of this goal is demonstrated through multiple metrics including faculty evaluations of student-patient interactions on clinical rotations and standardized patient examinations, and didactic year courses such as physical diagnosis and cross cultural counseling. Areas accessed include patient centered history taking, physical examination, clinical reasoning, communication skills and cross cultural competencies. In 2017, preceptors rated our student patient care performance at 95.5% overall. Successful achievement of this goal is demonstrated in courses such as Clinical Medicine I, II and III and Integrative Medicine and during patient experiences in the clinical year. Students are evaluated on their critical thinking and research skills during their epidemiology and research methods courses. In their final semester, all students are required to complete and present a research project to CUNY School of Medicine faculty. The most outstanding research projects are highlighted and awarded certificates of merit at commencement. Successful achievement of this goal is demonstrated as all of our students clinical experiences are located throughout New York City (Manhattan, the Bronx and, Brooklyn) and most of their training occurs in health workforce shortage areas. Our mission is to increase the number of traditionally underrepresented PAs and encourage them to increase access to care by becoming primary care providers. In a recent survey of five alumni classes 44% of responding graduates work in primary care. The CUNY School of Medicine PA Program is a mission-driven program, attracting students with a commitment to providing excellent care in underrepresented areas. In a recent survey of five alumni classes, nearly half of responding graduates work in underserved areas. 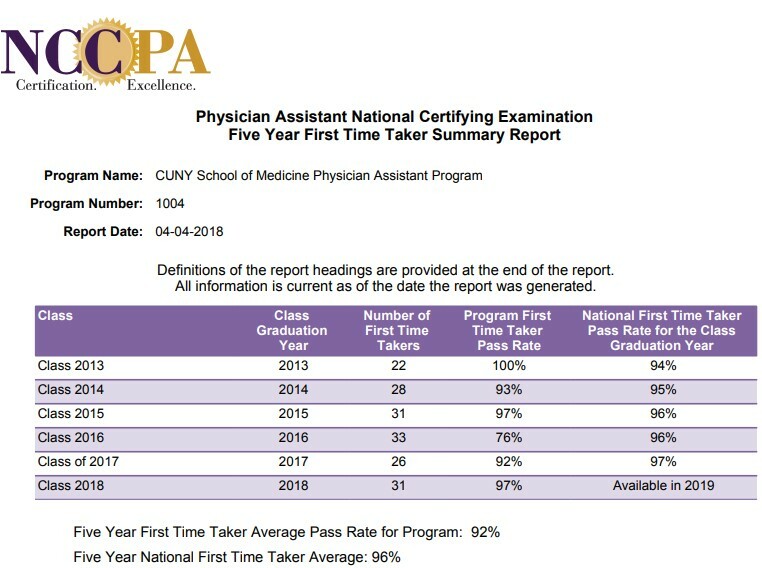 100% of the student body are members of The American Academy of Physician Assistants (AAPA) and the New York State Society of Physician Assistants (NYSSPA). Faculty motivate future leaders in the PA profession by encouraging participation, providing information about resources and activities and nurturing interest in the activities at the community, state and national level. Successful achievement of this goal is demonstrated by student society nominations, elections and evidence of other leadership activities. This goal is fostered from the onset of matriculation. During the “New Student Orientation” students engage in activities focused on promoting cohort and peer respect through team building activities. Students receive and review the handbook for academic policies and procedures during orientation and policy and requirements for students in the clinical year, which document PA Program expectations for professionalism, including our dress code. Our courses (Patient Interviewing, Preventive Medicine, Cross Cultural Competencies and Health Law and Economics) reinforce student, colleague and patient professionalism and ethics. In 2017, clinical preceptor evaluations demonstrated 97.1% of students exceed expectations in the area of professionalism. In Fall of 2017, CSOM PA and MD students with CUNY School of Professional Studies RN students engaged in a pilot 5 session on line workshop, “Introduction to Inter-professional Collaborative Practice”. The IPE activities focused on the importance of understanding the IPE roles of other healthcare professionals, effective team work, communication, team based care, shared patient-centered problem solving and identification of barriers to care. Through patient cases, journal reading, videos and discussion boards, students have the opportunity to engage, reflect, evaluate and enhance their interdisciplinary teamwork skills and behaviors. Successful achievement of this goal is further demonstrated by students being trained by MD’s, PA’s, nurses, social workers, nutritionists and epidemiologists in courses such as: History of the Profession, Preventive Medicine, Medicine, Cross- Cultural Competencies in Counseling, Clinical Medicine one, two and three and Integrative Medicine. Practical experience with interdisciplinary teams is achieved during clinical clerkships, which are located within New York City healthcare institutions with a wide range of healthcare professionals. Activities within the CUNY School of Medicine, such as interdisciplinary health fairs, the mini medical school and school wide social activities and wellness sessions (mindfulness and Zumba) scaffold and support interdisciplinary learning.